We have to give it to OnePlus - it managed to keep its heavily hyped phone in almost complete secrecy until half a week before the announcement. A record-like achievement, considering how rampant leaks sprout in the smartphone business. 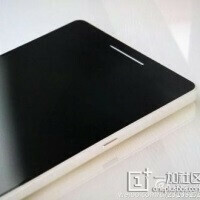 Still, ahead of April 23, alleged press renders of the OnePlus One are now out for everyone to see. While the photos do look legitimate, there's always the possibility they were put together by crafty designers. So don't take our conclusions as the final word on this phone.